PROVIDENCIALES, TURKS and CAICOS ISLANDS--(Marketwire - Sep 7, 2012) - To help people travel to Turks and Caicos easier and smarter, locally-based Turks and Caicos Reservations today launched its first in-depth destination guide to simplify planning and booking the ideal villa vacation in the Turks and Caicos Islands. Available immediately, free of charge, the 16-page Ultimate Turks and Caicos Villa Guide is a one-stop resource for villa selection in the Turks and Caicos and includes money saving tips, questions to ask before you book, what to pack and where to stay. "As reported recently by Forbes and consistent with what we see, people are traveling more frequently, for longer periods of time and often with family, friends, and children. This group travel trend is fueling an interest in villa vacations," said Val Kalliecharan, General Manager of Turks and Caicos Reservations in Providenciales. "Villas are becoming a popular choice for travelers because they can represent great value and provide a more authentic island experience. With our new Ultimate Turks and Caicos Villa Guide visitors have easy access to all the information they need to find, select and book a villa vacation in the Turks and Caicos Islands." 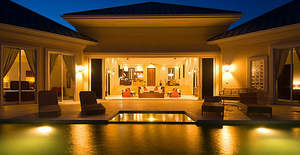 "Vacationing in the Caribbean is always a treat but staying in a villa can make the whole experience even more special. If you want to feel like a local on your next vacation, have the team at Turks and Caicos Reservations lead you in the right direction," said Ms. Charmaine Welch, a traveler from New York, NY, who recently used Turks and Caicos Reservations to book her last villa vacation. "Turks and Caicos Reservations has in-depth local knowledge and will help you find the right villa for your needs." Turks and Caicos Reservations is the only locally-based central reservations service for the Turks and Caicos Islands and offers insight and discounts on leading hotels, resorts and villas. With locally-based agents available seven days a week from 9:00 am to 9:00 pm (EDT) through toll-free phone, email, and live chat channels, Turks and Caicos Reservations provides the most comprehensive listing of accommodation options for the destination. Call 1-877-774-5486 or visit Twitter, Facebook, YouTube, Flickr to learn more. *High resolution photos available on request. The open air living room in Villa Balinese illustrates one of the many the benefits of vacationing in a villa. The Ultimate Turks and Caicos Villa Guide from Turks and Caicos Reservations provides tips and advice on how to rent a villa for your next Caribbean vacation.